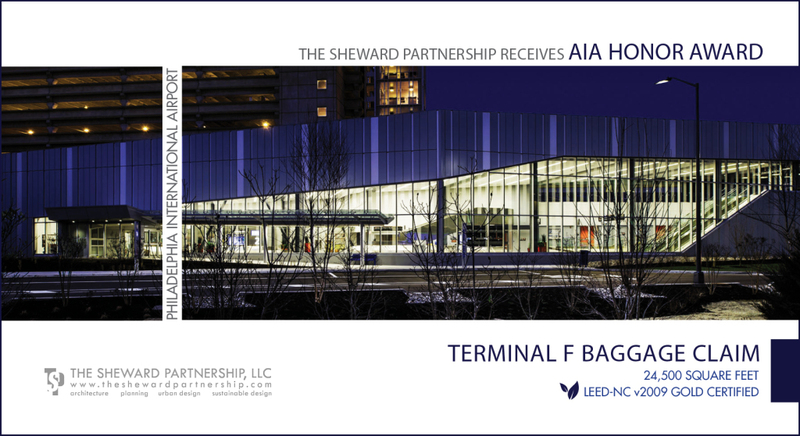 The Sheward Partnership is proud to announce that we have been awarded an AIA Honor Award for the design of the Terminal F Baggage Claim Building at Philadelphia International Airport by the Philadelphia Chapter of the American Institute of Architects (AIA). With nearly 300 state and local chapters, the AIA serves as the voice of the architecture profession, promoting design excellence and outstanding professional achievement through a prestigious awards program. Each year the American Institute of Architects’ Philadelphia Chapter, representing nearly 1,200 local architects, invites member firms to participate in the Design Awards. Selected by a panel of judges from a pool of over 100 project submissions, we are excited to be recognized for excellence in design and innovation and a strong commitment to the quality of life in the built environment. For an in-depth look at this innovative project, read our latest blog post here. Structural Engineering, Associate Architect, Airport Terminal Planner / BHS Design: HNTB Pennsylvania, Inc.
MEPFP Engineering, Security & Special Systems Engineering: ARORA Engineers, Inc.
Graphic Design Consultant: Daroff Design, Inc.
Civil Engineering, Geotechnical Engineering: Urban Engineers, Inc.